STORE-Safe has released a new-generation series of stores specifically for dangerous goods. The new range of stores and cabinets is designed for the storage of drums that can facilitate connection to continuous feed machinery. Store-Safe has manufactured three versions of its new dangerous goods stores that facilitate two drum, three drum and four drum capacity. Made to high standards and meeting and surpassing the requirements of AS1940, the dangerous goods stores feature spill control and capture facilities, extinguishers, signage and, for the first time, indoor safety escape latch and self-closing doors. According to Store-Safe managing director Grant Breeze, the new stores are the first of their kind to be manufactured to such high standards. "In the past similar stores have been made to a budget, not for durability or safety," Grant said. "The new generation Store-Safe dangerous goods stores have been designed for durability, longevity and maximum performance." Two Drum: 1450mm wide x 727mm deep x 2000mm high. Three Drum: 2100mm wide x 727mm deep x 2000mm high. Four Drum: 1450mm wide x 1450mm deep x 2000mm high. 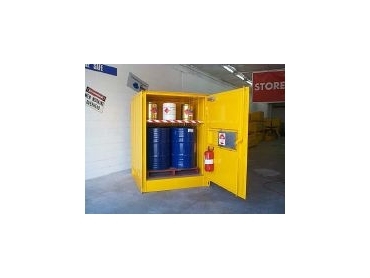 The four drum dangerous goods store can also facilitate pallet loading and extraction.